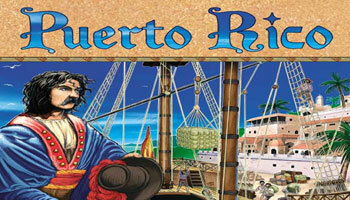 Puerto Rico is an role chose game, where the players take the roles as a colonial governor on Puerto Rico, trying to make the most productive town possible. By sending goods produced back to Europe, you can gain victory tokens. You also score when you construct buildings or when you meet other conditions. The player with the most victory tokens on the end of the game is the winner. 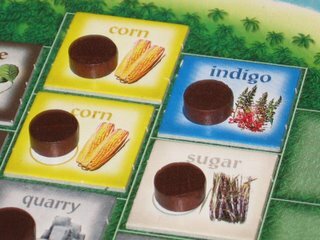 Every player uses a seperate board with spaces for buildings, plantations and resources. Shared between the players are 3 ships, a trading house, a supply of resources and doubloons. 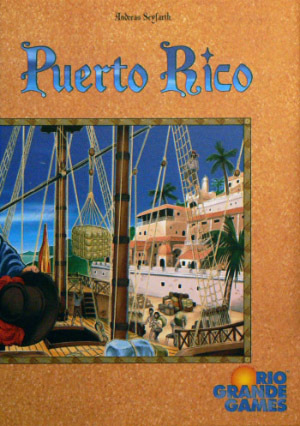 Puerto Rico uses a variable phase order mechanic; A governor token is passed clockwise to the next player at the end of a turn. The player with the token begins the round by choosing a role such as trader or builder and taking the first action. The players take the action appropriate to that chosen role. The player that selected the role also receives a small bonus. i.e. choosing the "builder" role allows all players to construct a building, but the player who chose the role will also get a discount during that turn. Unused roles gain a doubloon bonus at the end of each turn. When a player will choose that role later on, he will get any doubloon bonus associated with it. This mechanic will push the players to choose all the roles. Settler - You can take a quarry or plantation tile and put it on an empty space. Allow other players to take one plantation tile. Mayor - You get up to one colonist per empty circle on each quarry or plantation tile. Activates the tiles so production can start. Builder - Lower cost to build. Let the other players build one building at the normal cost. Trader - Sell goods at better rate. Other players can sell goods too. Craftsman - Take goods for each plantation or quarry tile that is manned. Allow other players to take goods in clockwise order. Prospector - Take one doubloon and pass play to the next person. Captain - Load goods of the same type onto a cargo ship and pass play. There are many buildings which the players may build in their city. Small buildings each benefit the player during a specific phase. The buildings are: production building, construction hut, factory, hacienda, harbor, hospice, market, office, university, warehouse and a wharf. There are also a number of "large" buuildings which take up to two building spaces: city hall, custom house, fortress, guild hall and a residence. The game ends when the mayor doesn't have enough colonists to fill the ship or when a player builds on his 12th space or when there are no more victory tokens. The winner is the player with the most victory tokens after a concluding event occured. In Puerto Rico, timing is the key. It's important to know when to farm goods, produce them, trade or ship them, or purchase buildings. One who masters this skill has a big chance to win the game. The game is all about micro-managing and to do this in a very optimized way. The game has a decent replay ability because often a player will pick a different role in every turn as they have to achieve a particular goal. 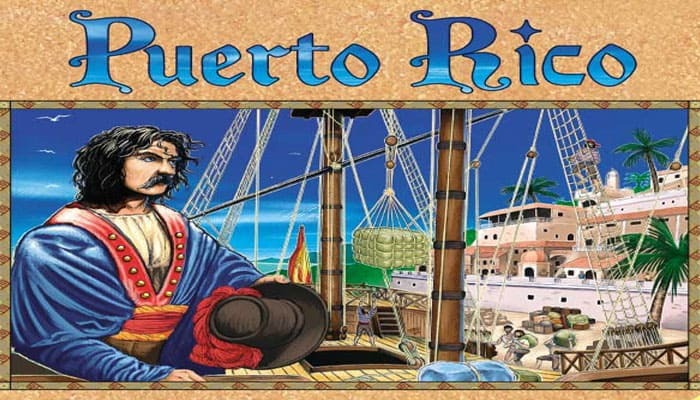 Puerto Rico is best played by 3 till 5 players of minimum twelve years old because it requieres a lot of strategy abd observation. You should pay attention to what your opponents are doing. Most games takes between 90 and 120 minutes. This is quiet long for people who like shorter games. At first, the game rules are a little difficult to understand, but after a few games this isn't a problem anymore.